Ben 10 is no longer a children's series - Ben10Toys.net for Ben 10 Toy Fans! From "A Knight to Remember" design has become more blessed, more dramatic and dangerous. Is almost as if they started an hour to the other to change the default style of the series, they came up with one of the best episodes, "The Inspector # 13," an episode with an interesting and great story and adventure and adrenaline to the top . In "The Solitary Alignment" showed us a different side of Azmuth, the love he had never shown before, with the regret of a lifetime that can be felt and even mentioned by him. In scenes that were so obscure that even the "Kevin" could not see, George tearing the heart of the beast Diagonal. In "The Enemy of My Friend" to Charmcaster proved to be a villain of a kind cold, cruel and dramatic, but on "Couples Retreat" romance and revenge were predominant. Without forgetting that we can see half-naked Charmcaster using sweater giving a ... These episodes were unique, like everyone else after "Inspector # 13" proved to have a different touch than we have seen. In "Catch A Fallen Star" I do not know what to say, was one of the most striking episodes that we have seen, when it seemed that Ben had been killed as Clockwork Gwen debuted at the cry, until it finally returns to normal. The final, extremely dramatic. It was unforgettable, the death of Jennifer Nocturne and holding the enemy Captain. The passion that was born between the two was short, but certainly memorable for all of us. 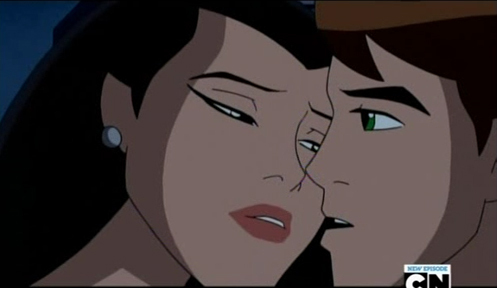 In order to show what he wanted was that times are changing, with us Ben 10 is also maturing. Scenes that we could never imagine in the series are influencing the episodes. The Drama, Passion, Romance and Adventure are the things that are being added to an extreme level, this does not prove that Ben 10 no longer serves us, but he is adapting to the public who always followed us. Ben 10 is a unique design on the other, it shows acts of heroism of a simple boy who has the most powerful weapon in the universe. This post can show that Ben 10 is getting inappropriate for their age, knowing that nobody respects age. But anyway, Ben 10 is evolving or just changing to another public its principles? This is what we will see over time, is finally getting a new era, Omniverse, and what will become of us in it, we do not have an idea of what is, for now! wow, i just wish every1 at school would stop saying its for little kids, and actually watch a recent episode of ultimate alien!!!!! !